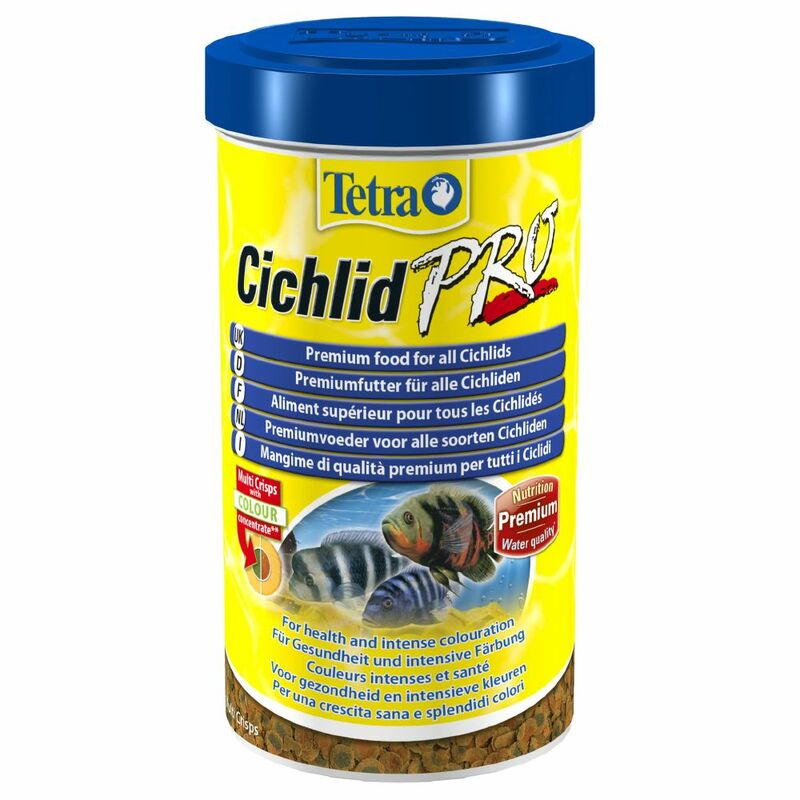 Tetra Cichlid Pro is a premium, complete cichlid food optimally adapted to the needs of cichlids. With its high concentration of nutrients it helps keep your fish healthy and boosts their immune system. The food comes in an innovative Multi Crisp form, which is well-accepted and easily digested, reducing exceΒ food causing water pollution. Cichlids are an incredibly popular ornamental fish because their beautiful colours makes them a joy to watch. But beauty comes at a price, as cichlids are quite demanding in terms of their environment and their nutrition. Tetra Cichlid Pro can easily meet these demands! This flake food has a high nutrient content as it is gently prepared at low temperatures, so all the ingredients retain their nutrients. It also contains natural colour enhancers and other ingredients to help boost the colour intensity of your fish. The innovative Multi Crisps form prevents the food from sinking too quickly, leading to a high acceptance at a reduction in water pollution. Tetra Cichlid Pro at a glance: Premium food for all cichlids, guaranteed to meet their nutritional requirements High nutrient contentfrom being gently prepared at low temperatures Balanced composition Natural colour enhancersand other ingredients for more vibrant fish BioActive formula for a stronger immune system andlong-lasting health Innovative Multi Crisps form Excellent acceptance Easy to digest.